Kansas City Marriott Downtown welcomes you to Missouri with modern style, excellent service and a fantastic location. Our hotel is ideally situated just a short walk from the exciting Power & Light District - Kansas City's premier destination for entertainment and nightlife. Make yourself at home in your spacious, gorgeously renovated room or suite, which features floor-to-ceiling windows, pillowtop bedding, an ergonomic workspace and high-speed internet access. Elsewhere at the hotel, you can have a great meal at one of our on-site restaurants, which offer contemporary American cuisine and superb cocktails. Additional perks for your downtown visit include an indoor lap pool and a fully equipped fitness center. Those planning events in Kansas City will appreciate our adaptable venues, which total over 95,000 square feet of space. In addition to being near the Power & Light District, our hotel is moments away from Sprint Center, Arrowhead Stadium and more. Plan your getaway at Kansas City Marriott Downtown. 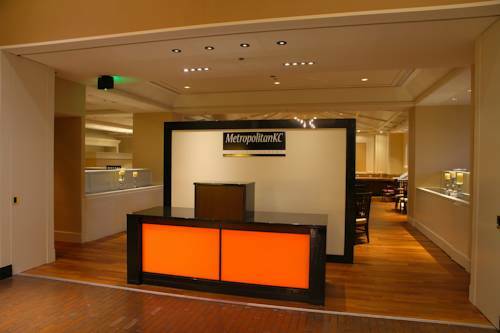 MetropolitanKC: Flavorful American fare is on the menu at MetropolitanKC, our signature restaurant. Fuel up for a busy morning in Kansas City with a tasty breakfast, or join us later in the evening for a meal and a drink. BARCENTRAL: Immerse yourself in the energy of downtown Kansas City at BARCENTRAL, our sleek restaurant and lounge. Whether you're joining us for an informal lunch or a post-work drink, you'll love the relaxed atmosphere and innovative cuisine on offer here. Fresh Bites Dining - A Modern Take on Room Service (Delivery or Pick-Up Only): Fresh Bites, our in-room dining experience, features handcrafted, locally-sourced food delivered quickly to your door without carts or fuss. You can enjoy your food in your accommodations, or take them on the go with you. CoffeeCentral: Jump-start your downtown adventure with a freshly brewed Roasterie Coffee, coupled with a house-made pastry, at CoffeeCentral, our welcoming coffee house.